Root canal therapy or Endodontic treatment by Dentist Geelong are done to remove infected tissue and keep the shell of the tooth by preserving the structure, so that the function and aesthetics of the teeth and the mouth can be maintained. 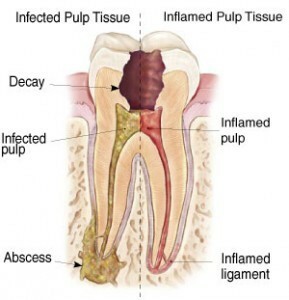 The lifetime of a root canal treatment differs depending on several factors. Some of these factors may include the severity of the infection, any structural defects in the tooth. The aim of the root canal treatment is to keep the tooth as long as possible. There is a possibility that reinfection and decay can reoccur. In general, a root canal has a 95% success rate, if the treatment is done properly and it is adequately restored. At times a root canal may need a retreatment. Root canal treatment may involve one to three appointments with our dentists in Geelong, depending on the reason for treating the tooth. Root canal is not a painful procedure, but a long complex appointment that usually takes 30 to 60 minutes. Local anesthetic is given by the dentist, an x-ray is taken and a plastic rubber sheet is placed on the tooth which is held by a clamp called button. This is known as rubber dam. The rubber dam helps in isolation of the tooth from the saliva which is full of bacteria and enables the dentist to work in a clean environment. Any fillings on the tooth are removed and decay is removed and a filling is re done by the dentist. If necessary a band is placed around the tooth, which helps in holding the tooth together and avoids the tooth from further cracking. An access hole is made in the middle of the tooth and the canal openings are found. This would depend on the tooth. As a general rule front teeth’s have one nerve and as you further go back, the number of nerve increases. I.e. molar teeth have 3 to 4 nerves. The tooth is washed with antibacterial solution, small thin files are inserted into the tooth and the nerve canals are cleaned out. An antibiotic containing a painkiller is placed into the tooth and a temporary filling is placed where the access is made by the dentist. It is not unusual for patient to experience pain after this appointment with the dentist. A painkiller such as nurofen plus can be taken if pain persists. The dentist in geelong will discuss this with you. During the second appointment with the dentist, once again rubber dam placed on the tooth, local anesthetic given. Then the tooth is opened, washed out with antibacterial solution and the endodontic files are used to clean the tooth. The files are used in ascending sizes and the tooth is infection free. A dressing is placed by the dentist which has no pain killer and a temporary filling is done by the dentist. If the tooth has not been symptom free, then the root canal isn’t finished off and the tooth is redressed again. No local anaesthetic is given, rubber dam placed on the tooth and the nerve canal and the nerve canals are filled. A permanent restoration is placed on the tooth by the dentist. Root canal treatment removes all the nerve and blood supply of the tooth and the structure of the tooth are left behind. As the tooth ages, the tooth becomes brittle, therefore restoring the tooth with a dental crown is highly successful and will last a long time. If any further difficulties or complications arise, the patient is referred to an endodontist – root canal specialist. In addition, all teeth that had the root canal treatment done should have a dental crown called dental caps placed on them. This will protect the tooth and prevent it from breaking and restores the teeth to its full function. If you need any emergency, affordable root canal treatment done at our Dental Clinic in Geelong, Please vist our best Endodontist in Geelong at Norlane for your next root canal treatment.